J. Robert DiFulgo served in the United States Navy for three years, including two tours of duty in Da Nang during the Vietnam War. He taught government and politics in the Fairfax County Schools, Virginia, for thirty years. 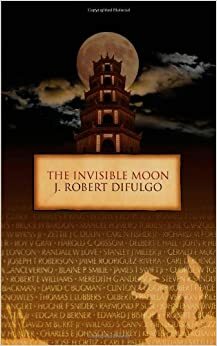 I love the cover of his novel, The Invisible Moon ( Athena Press, 216 pp., $17.95, paper). It features a stylized pagoda with the moon sitting on top of it. Beneath the title appears to be a close-up photo of names on The Wall in Washington. In the lower right corner, ghostly outlined figures of Vietnamese in VC garb, including the conical hats, skulk toward weeds. Even with a magnifier I could not spot any weapons. The names of the honored dead are printed over the scene of the creeping Viet Cong. The second-to-last chapter takes place at Arlington National Cemetery in 1993. It is a short trip to the final chapter set at the Vietnam Veterans Memorial. The main character, Bryan Ruocco, visits The Wall with the son of his best friend in Vietnam, Gregory T. Seaton, who did not return alive. It is at that point that I became certain that this Vietnam War novel had become that rarest of items, one that has a homosexual theme. It turns out, though that this book is more like other Vietnam War novels than it is different. Bryan and Greg are in Da Nang on January 27, 1968, so we get a first-person view of the Tet Offensive and are given much background on the celebration of the Tet holiday. The depiction of the Tet Offensive is gritty, believable, and one of the great strengths of this novel. Antiwar protesters are described as “untidy people” with long hair and beads who call returning Vietnam vets baby killers and spit at Marines. We even get to see, briefly, Bryan’s old girlfriend spitting on a Marine. I recommend this novel to those who are seeking fictional, but accurate, depictions of gay men in the military during the Vietnam War. It has strong characters and tells a gripping story. Small Fires in the Sun by Herbert R. Metoyer, Jr.